On October 19, 2018, USDA officially announced the eradication of pink bollworm (Pectinophora gossypiella), a devastating pest of cotton crops that first invaded the U.S. over 100 years ago. The first two infestations, Texas in 1917 and Louisiana in 1919, were quickly eliminated. In the 1930s, the pest again invaded the Rio Grande Valley, but this time it proved more difficult to control, and it spread through surrounding states, reaching California by 1963. APHIS started regulating pink bollworm (PBW) in 1955, and 10 states were under quarantine at the height of the program. Over the years, USDA, state departments of agriculture, the U.S. cotton industry, and growers carried out extensive research, regulatory, and control activities in ongoing attempts to eliminate PBW from cotton-producing states. Multi-state activities included using insect pheromones to disrupt mating, planting transgenic cotton expressing insecticidal proteins (Bt cotton), and releasing sterile insects to prevent reproduction. In 2003, four states remained under quarantine for PBW (Arizona, California, New Mexico, and Texas). In 2011, in order to help support eradication efforts, including extensive trapping to monitor for the presence of PBW, ITP released an identification tool, Pink Bollworm and its Look-Alikes. The tool aimed to support the surveys that were required in each of these four states to ensure eradication of the pest. It included two keys: one for adult moths that can be found in PBW sticky traps, and one for larvae that allowed differentiation between three other species that can be found in cotton bolls. In his proclamation, Secretary Sonny Perdue states that after five years of extensive trapping, USDA "finds all areas of commercial cotton production in the continental United States free of this costly pest" and removes "all remaining restrictions on the movement of cotton." All PBW quarantines have been lifted, easing the movement of cotton to market both domestically and internationally by eliminating requirements such as fumigation, as well as the costs of monitoring and control. 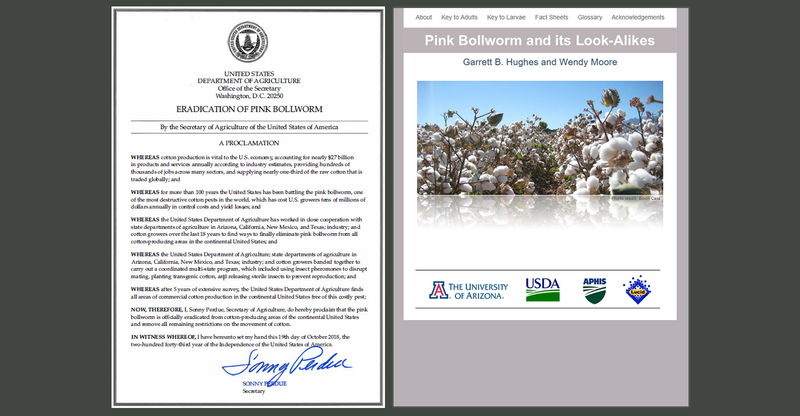 ITP aims to keep our collection of identification products current, so we are responding to the Secretary’s proclamation by retiring Pink Bollworm and its Look Alikes, since it is no longer needed. This is the first ITP tool we’ve retired, but we see it as good news; we’re pleased to take this action in response to a rare and long-hoped for pest eradication.